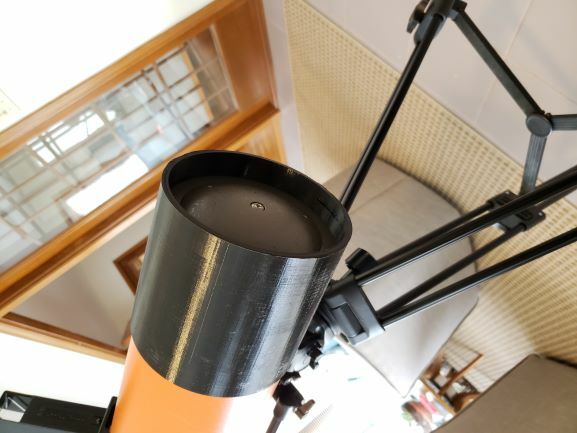 Finally took the plunge into 3D printing and a big incentive was to do custom astronomy stuff and one thing very high on my wish list was a light shield for my Comet Catcher. The Comet Catcher is one of my most used scopes and this is because when I use my night vision eyepiece, I can hand hold it or sit with it in my lap. The portability allows me to walk around the yard or even down the street to get views past obstructions. The issue I encounter though is that because there is zero baffling in the Comet Catcher, and because a lot of neighbors have porch light, I am constantly getting light flooding into the field of view. Using an image intensifier makes this many times worse because even the smallest leak pretty much gets picked up and amplified 80,000 times. The answer then would be to have a light shield that would project enough to deal with most of the lights, but not long enough to make the scope cumbersome. Design goals were to allow for a slip fit over the front of the tube but there was a secondary design objective that would be that when in the stored position, it would have enough extension to act as a support when standing the Comet Catcher on end. The Comet Catcher has a weirdly rounded back casting so it cannot be stood on its base. Having the light shield extend down 25mm when the shield was in the storage position would fix this. This though adds a problem. There are three screw heads around the tube at either end to hold the corrector cell and the mirror cell. There are curved channels designed into the ID of the tube that run all but 25mm of the tube length, where the tube thickens to 10mm to support the base when in the stored position. In order to self store, I could not use an internal stop in the scope to keep the light shield from sagging. I attempted to address this by making the shield long enough so that it extended past the focuser, so I designed this into the shield. Even with this though, there is still a bit of sag and the solution will be to simply print a small radius block that will act as a limit and attach this to the tube at the correct point so that the shield butts up against it when it is installed. Material is PETG. This was very hard for me to print. Even after trying to optimize my slicer for stringing, I could not make it go away, so the print had a lot of strings and in a couple of cases, these formed little lumps in the finished print, but these were dressed out with a fine file. It fits pretty well but I still need to dress some irregularities on the inside. Still needs some sanding and I will try to polish the outside but flat black paint the inside. If anyone that has a Comet Catcher wants the .stl, just PM me your email. Still learning, but this was a very big print and while the finish was a bit rough, but I think I can clean it up nicely. 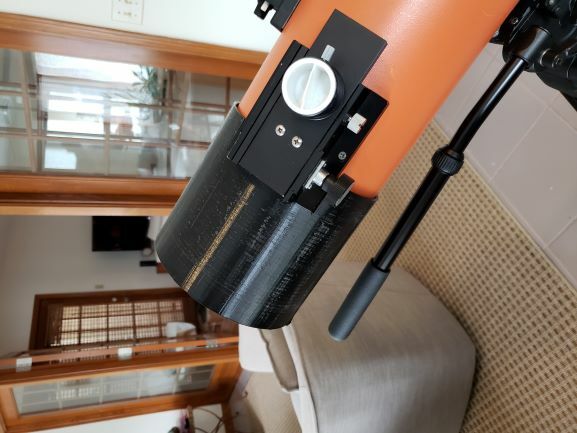 Looking forward to making a lot of useful Astronomy stuff! Edited by Eddgie, 06 January 2019 - 01:10 PM. 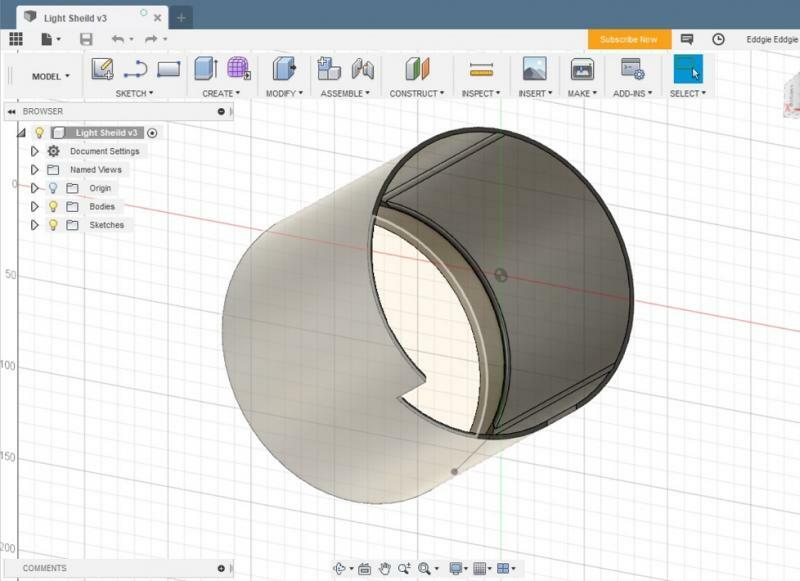 Fusion 360 CAD drawing for Light Shield so details can be seen. Ed, what printer did you use? The Anycubic Mega S, which is an updated version of the Mega 3. Main difference is that it has a Titan (or clone) extruder. I just got it over the holidays. Amazon had a $50 off coupon, so I got it for $309. Beautiful prints with PLA, but I could not dial out all of the stringing using PETG. I could get good results using small stringing test prints, but the first time you get a string, it tends to waft around in the fan current and sometimes fold across the wall. Downhill from there as plastic builds up on the outside of the nozzle. The print started beautifully though, and overall, I am happy with and think it will finish up nice enough with a bit of work. I am thrilled though. I tried cutting non-rigid plastic sheet to make a light shield and simply could not do it. Edited by Eddgie, 06 January 2019 - 01:39 PM. Sounds like fun, I've been looking at 3d printers for quite a while, but have no exact need so haven't bought one yet. Moshen turned me on to a Prusa MK3, which is what I'd probably get. But there's always a wait for them (and they seemed to have a minor extrusion problem that I was researching) and since I have no specific need I haven't done anything yet, but it looks like fun and would be pretty handy to have. I have little things I'd like to try, maybe later this year or if I ever get to something that I think is important enough. Thanks for the post and please post anything else you do with it of interest. Especially anything you do with it with regard to astro stuff or NV, any adapters or fittings, I'd been thinking about one for afocal fittings for various EPs and setups, etc. The light shield is a perfect example of something that makes the 3D printer nice to have. No one ever made a light shield for this and the focuser placement made the flexible wrap around kind of shield pretty much impossible. If you are willing to assemble it, you can get the Creality CR 10 for under $200 I think and these have good reputations. I sanded and put a coat of paint on the light shield and hope to take it out tonight for a test drive. 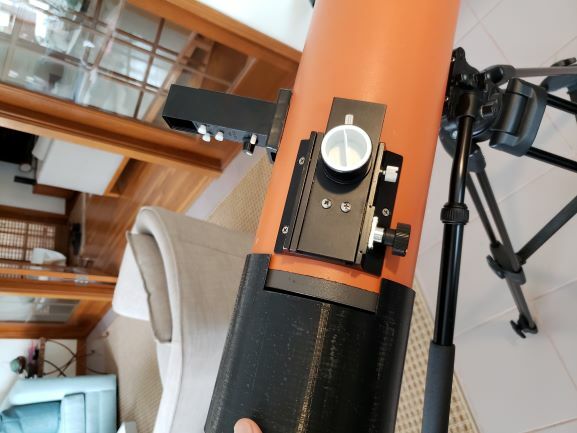 I also designed a radius block that I can print (2) and just attach to the OTA with a dab of hot glue to act as the registration point for the side of the shield opposite of the focuser, where it does droop a tiny bit. They are only 5mm high and 5mm wide, so will be very un-obtrusive. Next is Plasti-Dip paint job on the OTA! Just had my first quick look. Went out with the CC baby cradle style (no mount, just the Comet Catcher) and swept in to Orion Nebula just using long pass filter (650nm). Orion was just across the street from my oak tree which is still decorated with holiday lights. Orion was bright and pretty detailed. When pulled the light shield off, it practically disappeared. Slide the light shield on and there it was again. The lights from the tree were clearly leaking into the OTA with the shield removed. Next, I tried a 5nm H-a. This was a surprise. This is a super narrow cut filter and I would have expected not to see that much difference between the views with and without the shield. The filter is about 96% effective off of the narrow H-a band so I had expected that all of the ambient light would be pretty much blocked. Imagine my surprise when I pulled the filter and noticed a meaningful increase in field brightness. While it was small in comparison to the difference the light shield made using a long pass filter, it was not at all hard to see that there was a meaningful loss in contrast when I pulled the filter off. There are a lot of red lights on the oak tree though. Not a lot, but enough to make me realize that even when I thought I was not being badly affected in the past, I probably was being affected to some small degree when neighbor porch lights were leaking into the OTA in certain orientations . I looked at the Horse Head and Flame with the tree lights off, and there was almost no difference between with the shield and without so that told me that in this particular case, my tree was the offender, but I have had a lot of problems with the porch lights across and down the street in the past. I would say that it was a big success. I think that there are some further gains to be made by getting some really flat black paint on the interior of the light shield, and I am even considering making a couple of small baffles to go into the OTA. So, three tries to get this thing to print, but in the end, happy with the result. This will make using my Comet Cather less frustrating. I just had many nights where something I wanted to see would put the scope in a position where light could get in. I doubt that this completely solves that, but it clearly made a big difference tonight. Are you really going to Plasti-Dip your Comet Catcher?